In today’s world, there are so many things that help us live an easier life. However, many things that we keep in our house and use every day release toxic chemicals into the environment. Here are some things that may be harming the environment. It’s best to install a filter not just for your drinking water, but for your showers as well. This is because chlorine is not just bad for your skin, but the steam from the shower will distribute it around the room and around your home. There are all kinds of harmful toxins in laundry detergents. They can be harmful when absorbed in your clothes. Even worse, they get released into the environment via the exhaust vents. Make sure to buy plant based or otherwise environmentally friendly laundry detergents. Air fresheners release all kinds of harmful chemicals into the air, and they will eventually enter your bloodstream. Instead, use fresh flowers and candles that were made with essential oils. Cosmetics and makeup can contain various chemicals. Deodorants can contain aluminum. Start researching safer personal care products, from soaps and shampoos to deodorants and makeup. Nonstick pans make cooking easier, but they can contain polytetrafluoroethylene, which can be harmful to pets and possibly humans. You can use stainless steel instead, or just use olive oil or margarine. 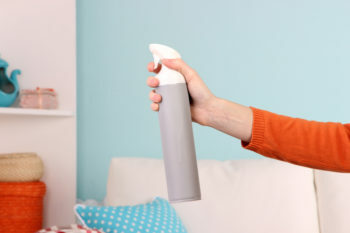 Stain blockers, which are sprays that protect your upholstery by spraying a plastic film over your couches, are cheap and easy to use. However, the plastic will eventually wear off and get absorbed into the air in your home. For more information on how to live in a green apartment, contact us today.